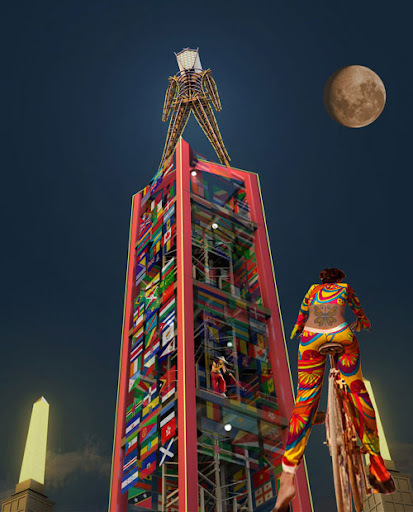 "This year's Burning Man will be the tallest ever, and will stand on top of a four-story obelisk. The monument will be draped with flags of countries from all over the world. Inside the obelisk, a double-helix like strand will create a spiral staircase that will resemble DNA. The "Man" will be burned on Burn Night on Saturday, August 30th." What do you think? Cast your vote! Want to go to Flipside? Hey everyone, Lance Hunter of Flipp'd OUT here. Tickets for Flipside 2008: Dr. Tiki’s Combustible Medicine Show go on sale starting Jan 7 thru Jan 11, 2008 . All tickets for Flipside 2008 will be sold via Mail Order (snake oil not included). The Official Flipside Ticket Order Form is available to fill out now. First, you must access the form itself, fill out your information, and submit electronically so we have all of your details. Next, print the form and obtain your Money Order with correct payment value to match your form. Fold your form and your money order and put your nicely folded bundle in a pretty envelope, buy a stamp or get your nice Post Man to put a stamp on your envelope (he may as well post mark it too) and mail it to us, with a post mark between Monday Jan 7 and Friday Jan 11 (7-11, get it? That’s easy to remember!). Simple, easy and fun! NOTE: THE FIRST DAY YOU CAN SEND YOUR TICKET REQUEST IN THE MAIL IS THIS COMING MONDAY, JANUARY 7. Two adult tickets per order. One order per person. Tickets will cost $70 each for adult tickets age 13 and up and $35 for kids 7-12 (Kids 0-6 are free). Payment is accepted by Money Order only! If you send any other form of payment, your request will be sent back unfilled. Make sure you save your money order receipts, if your order is not filled you may need that to turn your money order back into real dollars. Please make sure you print your name and return address legibly on your envelope! Will Call: NO NAME CHANGES will be allowed for Will Call tickets. Don't do Will Call unless you are sure you personally will be able to pick up the tickets when you arrive at the gate. ID will be required.